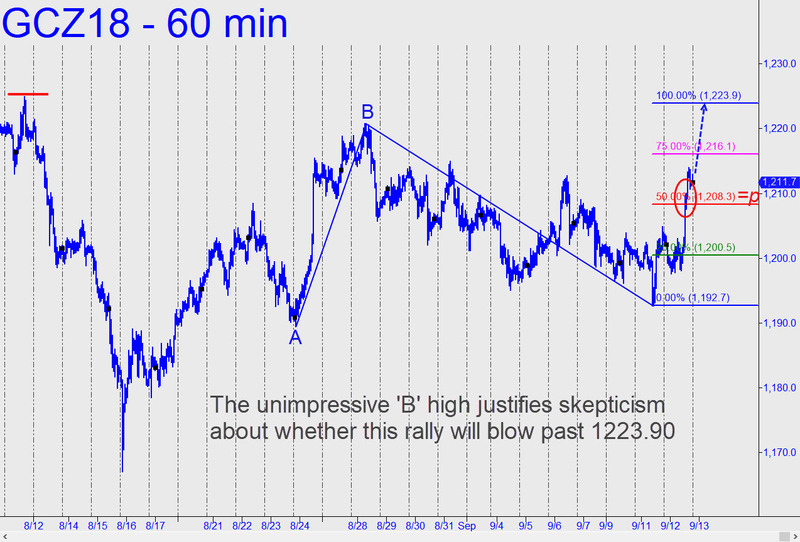 Is the Rally in Gold Just Another Tease? I�ve been so skeptical about gold�s rallies for so long that I�ll stick closely to the technical evidence to guide me this time, lest I miss the start of the real McCoy. Although the December contract looks almost certain to reach the 1223.90 target shown, I doubt that it will push far past it. That�s because the point �B� high of the pattern was so anemic, failing to exceed the mid-August peak. That would have generated a robustly bullish impulse leg on the hourly chart, making the current move more likely to get legs. Whatever happens, we should watch closely to see how buyers handle the Hidden Pivot resistance at 1223.90. If they demolish it, that would be reason to trade more aggressively with the flow. For now, however, traders should regard a move to that number as all but inevitable. If you don't subscribe to Rick's Picks, just click here for a free two-week trial. It will give you instant access not only to the chat room, but to actionable 'touts', intraday alerts and impromptu �requests� sessions online.